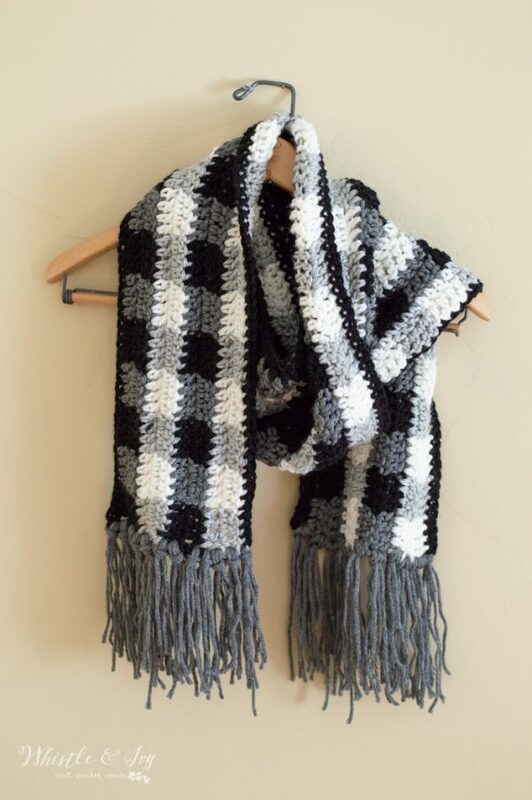 This scarf is so classic, so I am hoping it will be one of your easy go-to projects. I think because buffalo plaid is so timeless, this pattern will be great for men, women, teens… everyone. And because it’s not an infinity (you can find my plaid infinity scarf here) it will be a more versatile finished item for your gift list or crochet shop. 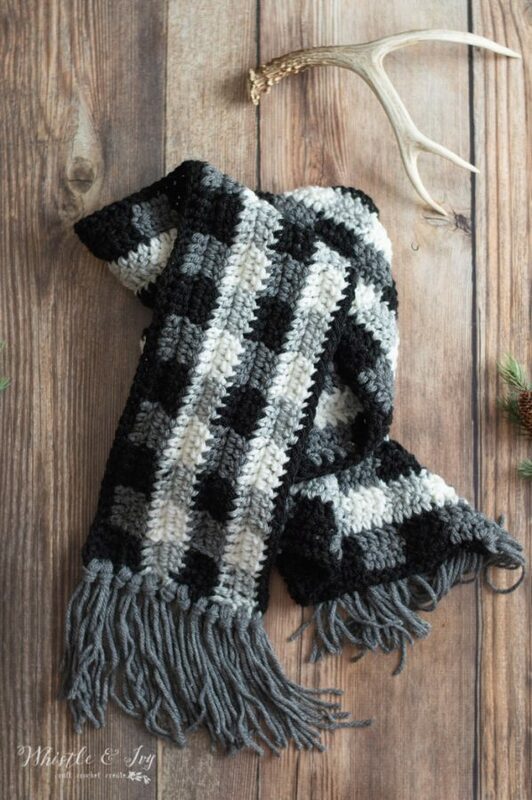 It’s also a super easy pattern to modify; if you don’t want to use bulky yarn, you can make this scarf with worsted yarn simply and easily. Be sure to check the pattern notes for guidance on how to do this. Sizing – You can adjust the sizing of this scarf by work more or fewer stitches on the foundation. 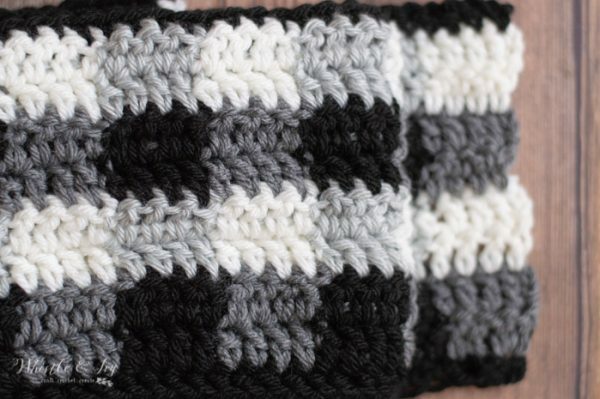 (This is especially helpful if you decide to use different yarn or different size hook) The count will be in multiples of 4 or 8, as this scarf is worked in a 4×2 plaid stitch (each color block will be 4 dc wide and 2 rows tall). If you decide to change the count, please note if you work your foundation in a multiple of 4 (instead of a multiple of 8), you may end row 2 on a different color, so disregard the color instructions and work the color you need for your own plaid color work. 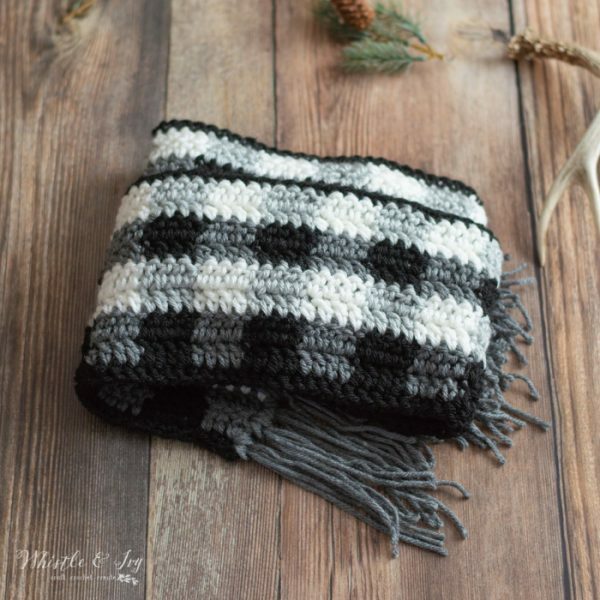 This scarf is also worked in a 4-color plaid, but if you prefer three colors, simply use the same mid color for both rows instead of alternating between 2 different mid colors. This scarf is worked lengthwise. 3. Continuing with Cobblestone Heather, Ch 2. Dc in same st. Dc in next 3 sts. Change to black. Alternate between Black and Cobblestone Heather every 4 sts (your colors should line up with pervious row)until the end of the row. Turn. (176 sts) Don’t cut yarn. Ch 2. Dc in same st. Dc in next 3 sts. Change to White. Alternate between Dove Heather and White every 4 sts, until the end of the row. Turn. 5. Continuing with White, Ch 1. Dc in same st. Dc in next 3 sts. Change to Dove Heather. Alternate between White and Dove Heather every 4 sts (your colors should line up with previous row) until the end of the row. Turn. 6. – 9. Repeat rows 2 – 5 respectively. When you need the colors, simply pull them up from where you left them. 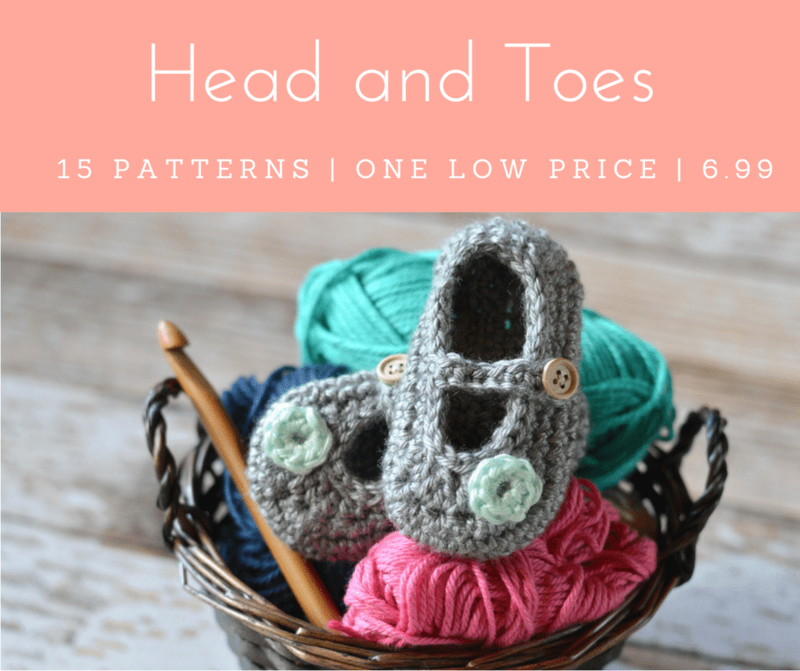 You can cover these yarns with fringe, tassels or a row of sc later. 10. Pull up black. Ch 1. Sc in each st across the top. 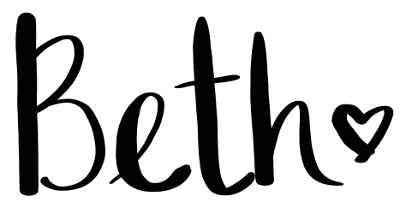 You can either work a round of sc all around the scarf, or just across the ends (if you are using Brava Bulky, you will not have enough black to do an additional round all the way around, so use Dove Heather or White). For a classic look, you can also hide the raw ends with fringe or tassels. I did three lengths of yarn for each fringe to make it look more full. I’m sure you can think of a few people who would love rocking this scarf! Hi Bethany, if I wanted to do this width way instead of length, would it still be multiples of 8? If I want to use green and mint what soul do my other 2 colors be ? I would think white or black? 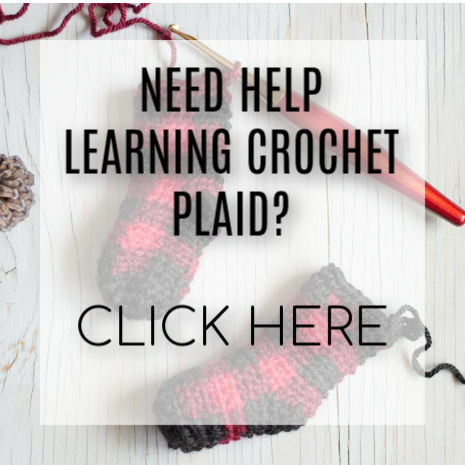 If I am using #4 yarn should I use a K hook or should I still use the N hook? You can use either, just work the chain to the appropriate length, making sure it’s in multiples of 6. Love this scarf! Thanks for sharing! do you cut the yarn with each color change? How exciting to realize it is someone who used to be my neighbor! Haha! I don’t know how exciting it is, LOL! Do you remember which blog? I would like to give them a “thank you”! I am enjoying your emails, blog and Facebook page so much! 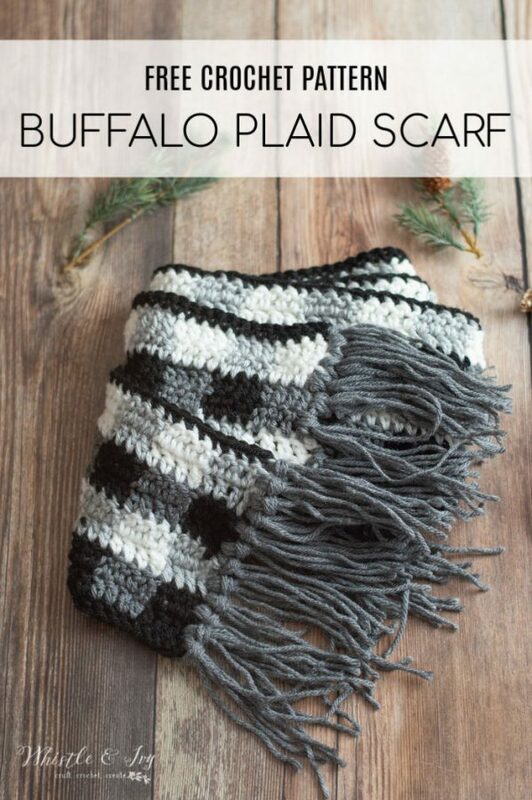 I love this scarf and I am going to try to make it for my son for Christmas. So many projects, so little time!! 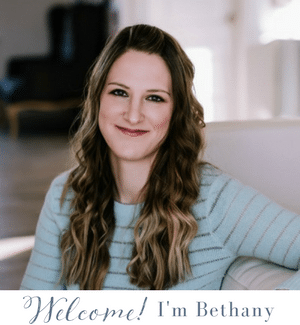 Thank you so much Beth! He will love it! As the pattern is written, what size will it be? I am assuming you can make it as wide as you want, but how long would it be? Thanks! Like it a lot! Same as the foundation, about 65″long. Like you said you can make it as wide as you would like, but mine was about 6″ wide. Thanks for your reply. Sounds perfect. I particularly like the 6″ wide. I have a short neck and cannot wear those super wide scarves. 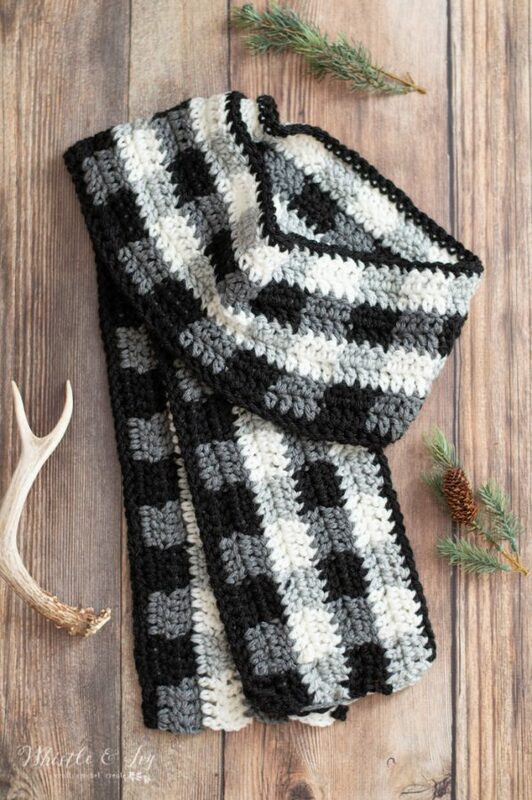 OMG I love your Greyscale Plaid Scarf. Thank you so much for the free pattern. It’s beautiful. Thank you! I’ve had a ton of scarf requests but only offered infinity scarves in plaid! We will NOT tire of plaid, and we will never tire of your plaid patterns. Another winner. As I like scarves a bit wider, I will add one more black and grey “row” (column?) to widen it a bit, and thanks to your teaching skills, I’ll have no trouble doing that. :) Thank you! Thank you so much Judy! I thought about doing another row as well, but this is a gift for someone and I wasn’t sure how wide to make it for a man. I am a bit weird, haha!